Russian cosmonaut Sergei Prokopyev to the ISS. 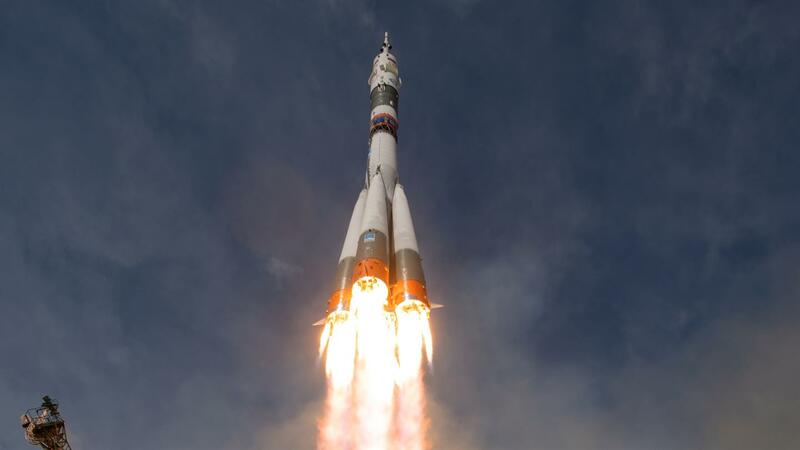 the Russian space agency Roscosmos and the flight management. try out their seats in the Soyuz Capsule. suitcase. Alexander Gerst mounted his GoPro on it. The Soyuz launcher has arrived at the pad and is being raised into the upright position. 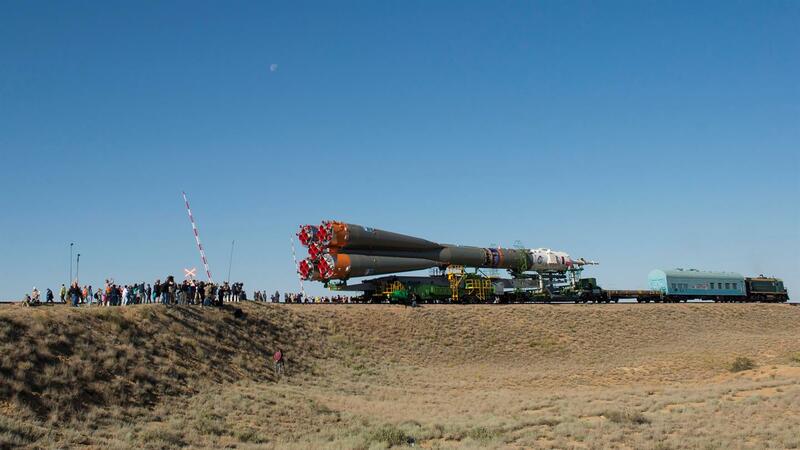 On 4 June 2018, the Soyuz rocket that will take Alexander Gerst to the ISS was rolled out to the same launch pad as that used for Yuri Gagarin's 1961 mission. 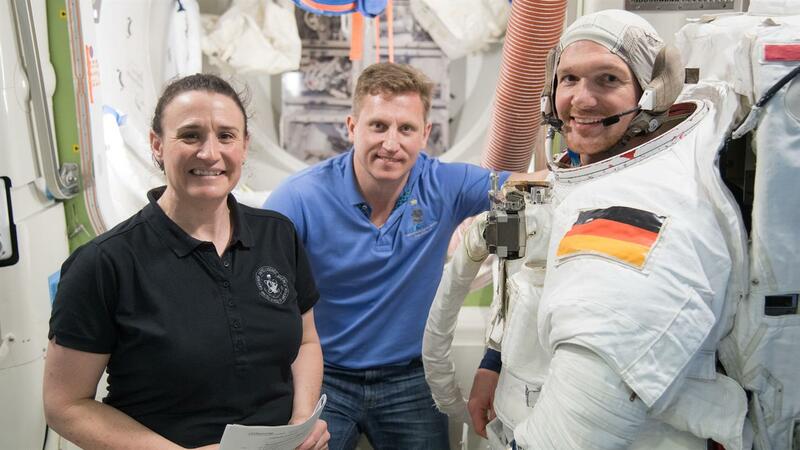 German ESA astronaut Alexander Gerst (right), NASA astronaut Serena Auñón-Chancellor (left) and cosmonaut Sergei Prokopyev (centre) wearing their Sokol launch suits in preparation for their flight. Serena Auñón-Chancellor, Sergei Prokopyev and Alexander Gerst working in an Earth-based training module, preparing for extravehicular activities. 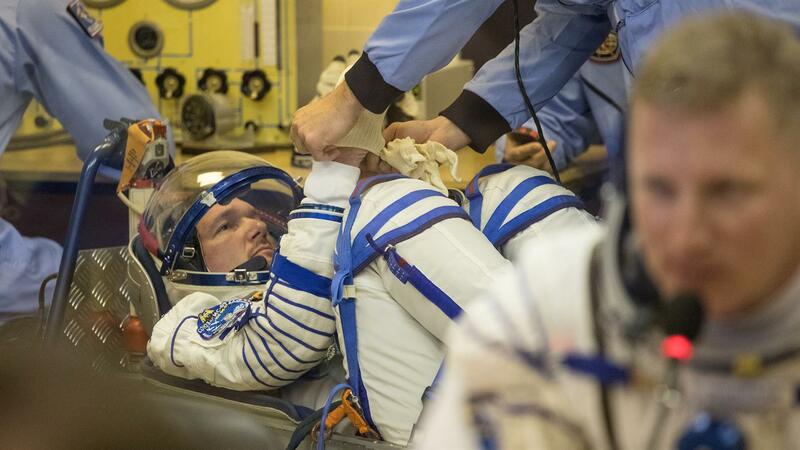 On 18 May 2016, the European Space Agency (ESA) announced that the German ESA astronaut Alexander Gerst would be undertaking a second spaceflight after his successful 2014 ‘Blue Dot’ mission. On 29 May 2017, Gerst himself introduced his new mission – ‘horizons'. Today, 6 June 2018, the 42-year-old geophysicist, along with his crewmates, NASA astronaut Serena Auñón-Chancellor and Russian cosmonaut Sergei Prokopyev, lifted off from the Russian Cosmodrome in Baikonur (Kazakhstan) at 13:12:41 CEST (17:12:41 local time) on board the Soyuz MS-09 spacecraft, bound for the International Space Station (ISS). “Germany has been an integral part of international crewed spaceflight for 40 years, and 10 other German cosmonauts and astronauts have carried out hundreds of scientific experiments into Earth orbit since the Soyuz 31 mission with Sigmund Jähn,” said Pascale Ehrenfreund, Chair of the German Aerospace Center (Deutsches Zentrum für Luft- und Raumfahrt; DLR) Executive Board. “Whether in research and development or space administration, DLR offers technological competence and scientific excellence together with its international partners for the joint operation of the International Space Station. Alexander Gerst’s ‘horizons’ mission is continuing the work of the past 40 years." 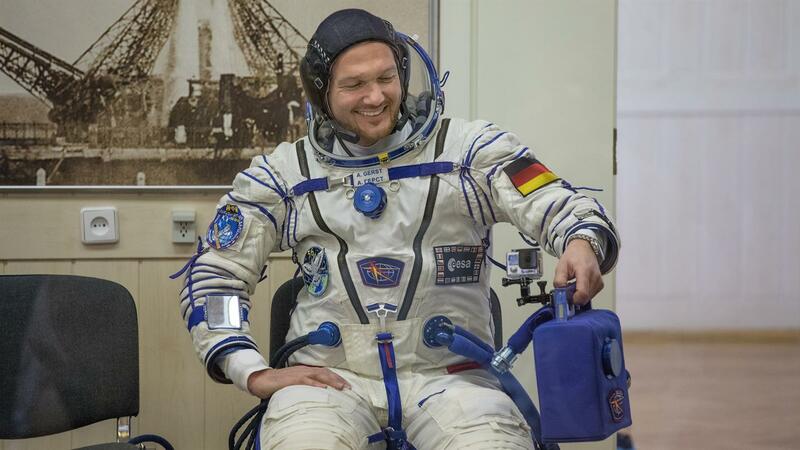 It is Alexander Gerst’s second long-term stay on the ISS. Until 13 December 2018, the German will live and work as a mission specialist in the largest research laboratory outside Earth, at an altitude of approximately 400 kilometres. Born in Baden-Württemberg – Gerst comes from Künzelsau in the district of Hohenlohe – he will complete a total of 67 European experiments, of which 41 come from Germany. From October, Gerst will also be the first German to command the ISS. The ESA astronaut is a member of ISS expeditions 56 and 57. DLR is responsible for the selection and coordination of the German experiments and for the German contributions to the ISS. Alexander Gerst, Serena Auñón-Chancellor and Sergei Prokopyev spent the last days before their spaceflight in the cosmonaut accommodation at the Cosmodrome in Baikonur. 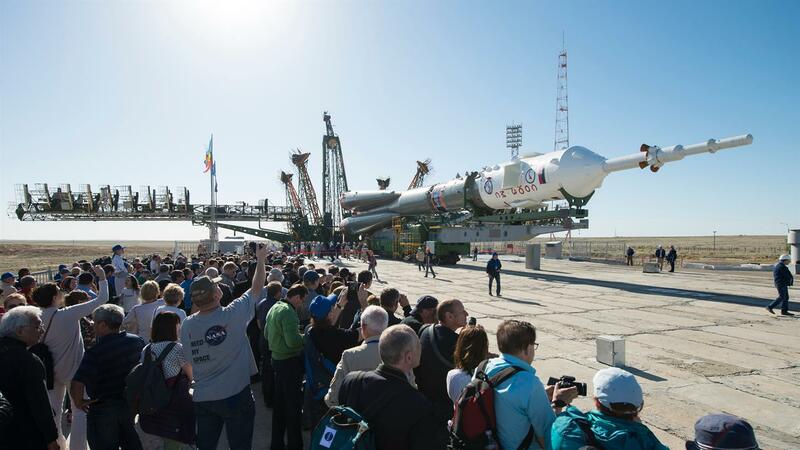 They have taken part in a whole series of ceremonies and rituals, such as the preview of ‘their’ Soyuz capsule and the blessing of the launcher. They also visited the Baikonur City Museum and the Cosmodrome Museum, including the house of the Russian cosmonaut Yuri Gagarin, who, in 1961 became the first person to fly to space. For both Serena Auñón-Chancellor and Sergei Prokopyev this is their first spaceflight, so they planted a tree on the Avenue of Cosmonauts in accordance with tradition. All three astronauts signed the door of Gagarin’s room and, on the eve of the launch, reported to the State Commission, which had representatives from Roscosmos, NASA, ESA and DLR. 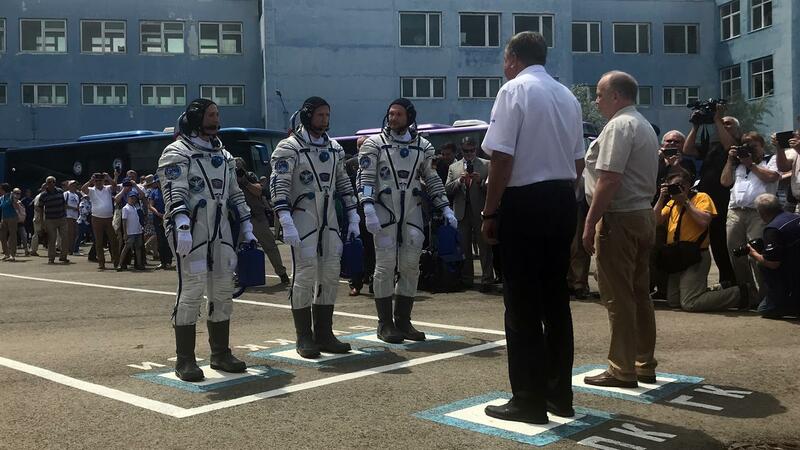 The crew said goodbye to their families and visited the hairdresser before putting on their Sokol launch suits and leaving building 254 about three hours before lift off. 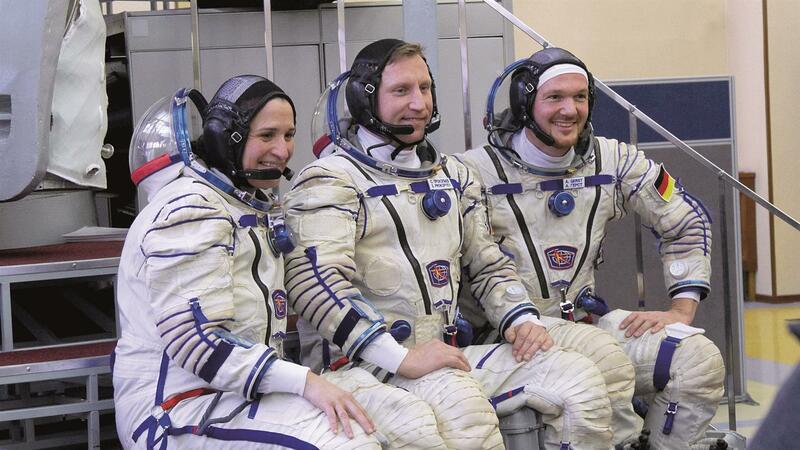 About two hours before the launch, Gerst, Auñón-Chancellor and Prokopyev took their places in the Soyuz spacecraft. The launch took place on schedule, from the pad on which Yuri Gagarin also took off on his mission in 1961. Prokopyev is a qualified pilot and commander of the Soyuz spacecraft, which is now on its way to the ISS and will dock with the space station on 8 June at 15:07 CEST, after a journey lasting just over 48 hours. “The Soyuz spacecraft needs two days, or 34 orbits, on this occasion because the differences in the orbital plane and phase angle of the ISS are too large for a four-orbit transfer, so the Soyuz needs more than four orbits (or six hours) to complete the orbital manoeuvres necessary to close with the space station,” said Volker Schmid, ‘horizons’ Mission Manager at the DLR Space administration, explaining the longer flight duration. At 16:50 CEST on the same day, the hatches between the Soyuz capsule and the space station will be opened and the crew will enter the ISS.